A happy bath time = a happy baby! Whether it’s the cold when they get out of the bath, the splashing or the wrinkly fingers, there’s always something that your little one might not like about bath time which causes a more stressful experience for the both of you. Bath time not only provides a lovely experience for baby when they’re enjoying it, but it’s brilliant for bonding time too. Whether you’re a mumma to be, or have a little one that already loves a baby bath, these 11 tips from personal experience will help to create a happy bath time from the get go that will help your baby to associate happiness and giggles with bath time. When you have a newborn baby you’ll most commonly start with topping and tailing which involves washing your baby from head to toe with a warm flannel. This will help to ease them in to having a wash and won’t be such a traumatic experience to start with! Don’t panic if they start crying, it can take a while for them to get used to this very new and what may seem like a scary experience. Topping and Tailing is a gentle way to expose them to bath time and you can gradually build them up to using a baby bath. They won’t get cold as quickly by topping and tailing as you can be on hand straight away with snuggly, warm towels for them. No matter what your age, a bubble bath provides so much joy, giggles and relaxation – just make sure that you use a baby friendly formula. Don’t overload the bath with too many bubbles, but just enough so they can enjoy splashing around with them and feeling the texture of them on those tiny hands – it really is the perfect bit of sensory play for them. 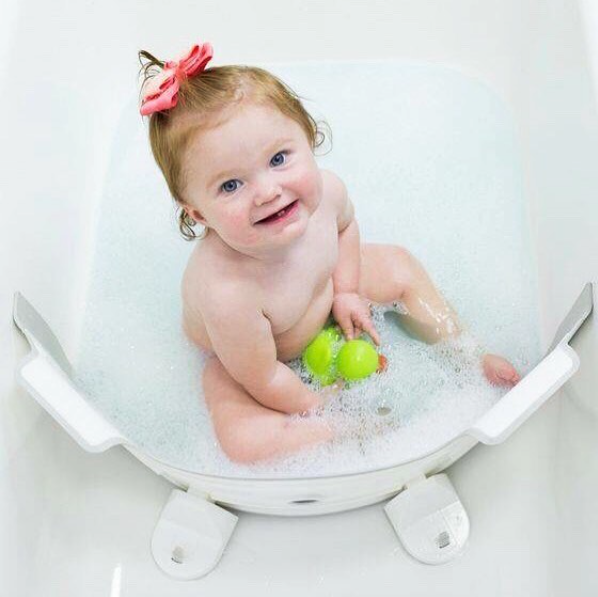 If your little one isn’t too keen on bath time reassure them that you’re there with them every step of the way with comforting and reassuring words, knowing that you’re there the whole time and within touching distance will provide them with the safety and security they need for a calm and happy bath. ALWAYS test the bath temperature before putting baby in, you don’t want it to be too hot or too cold. Run some cold water into the bath first and top up with warm water, between 36-38 degrees is the optimum temperature for a baby bath. The right temperature will ensure there’s no unnecessary tears at bath time. Establishing a night time routine with your baby is something that they will grow to learn and expect every evening. Try and do it at the same time every evening, the same you would with their sleep pattern. A nice warm bath, followed by a baby massage and a book in bed provides the perfect skeletal routine that anyone can incorporate into their babies routine. Don’t forget that baby bath time is a perfect time for bonding time with mum and dad too. Enjoy every second of that quality time with giggles, splashing and loving each others company. Quality time spent with your baby without any distractions will help to develop that bond and provide many happy bath times in your household. When you first put baby into the bath they may feel cold and want to get out, but ease them in gently and gradually warm them up by washing their body with a warm, damp flannel. Keeping them warm and not cold is your priority during bath time. If they’re just not enjoying it take them out wrap them up in a nice cuddly towel and try again tomorrow. Remember, Rome wasn’t built in a day! To stop your little ones teeth from chattering make sure that you have everything you need within an arms distance for when they’ve finished their bath. Make sure you have their towel, nappy change if necessary, pyjamas, a wash cloth and a changing mat so you can comfortably change them in the warmth of the bathroom afterwards. BabyDam can be used for newborn babies, and we know of some parents who have used it for their children up to the age of 5. With the ability to position it anywhere in the bath you can create the smallest area you require to a larger area for older children. Being able to create a custom bath size provides security and reassurance to your child, you even have the option of sitting on the dry side of the bath. It also means that you don’t have to be lifting up any heavy baby baths and emptying after use. Save your backs and keep your little one happy at the same time! To wash your baby make sure you use a child friendly, pH-neutral body wash that is gentle and kind to babies delicate skin so it won’t set off any sensitivities. Make sure it’s properly rinsed off afterwards to avoid any irritation. It isn’t any baby bath without bath toys! They’ll have just as much fun with some ducks as they will with an old cup for filling up and pouring out with water. You don’t need to spend the earth on bath toys because sometimes it’s the household products they like the most! A fun bath time = a happy bath time and bath toys will really help to up the engagement and enjoyment during it. What’s your top tip for helping to create a happy baby bath time? Keep up to date with the latest news from BabyDam over on our Facebook page or Twitter!